Very Good. Air Battle of the Ruhr by Cooper, Allan, 1992-04-30. Sewn binding. Cloth over boards. 176 p.
Good. 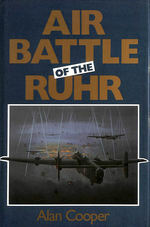 Air Battle of the Ruhr by Cooper, Allan, 1992-04-30. Sewn binding. Cloth over boards. 176 p.
Used-Very Good. VG hardback in VG dust jacket. A bright copy; slight wear at foot of dust jacket spine. Fine in Fine jacket. 8vo-over 7¾"-9¾" tall. New edition, 8vo, 228pp, photo illustrations, Fine Copy in Fine DJ. Very Good. Very Good Jacket. Size: 19 to 25 cm tall, Octavo, (8vo); 1st class post to the UK, Airmail worldwide. Robust packaging. 2001. Wrens Park. Hard Cover. Book-VG, spine ends rubbed. DJ-VG, minor edgewear. 9. x6. 228pp.